Professional & reliable groundwork and landscaping services, offered across Surrey, Sussex & surrounding areas. 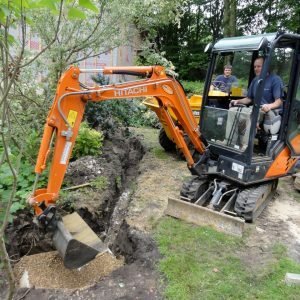 P B Groundworks have over 25 years’ experience in the groundwork and landscaping industry. We take pride in our work from start to finish and have designed and created many projects. It is our aim to ensure that we give the best possible advice and guidance at a competitive price. "Having used Phil and his team over a number of years we were confident that the work we asked to be carried out would be done in a timely and professional manor and once again he did not disappoint. We are very pleased with the results. I have no hesitation in recommending Phil"
Request a call back online now or alternatively call us on 01403 243191 for a no-pressure initial discussion of your groundwork needs. Do you need your garden levelled? Or perhaps you need garden clearance? We provide a competitive rate for the hire of a driver, mini digger and dumper.